At the beginning of the year we all do it. We set goals for ourselves and by the middle of February our motivation to chase those goals seems to vanish. There is good news and bad news. The good news it isn’t because of you. The bad news it’s because of how you set that goal. Oftentimes we set goals without thinking about the steps it takes to hit those goals. If you have a goal that will take 10,000 steps to hit there is a good chance that goal will not be accomplished in a years time. Not because of lack of drive but because it’s not a realistic timeline. In order to reach certain goals you need to set yourself up for success. We are going to focus how to set goals with a realistic timeline so you can start seeing results. Seeing results fairly quickly after setting your goal will keep your motivation going strong. Think of baby steps. In order to drop 50 lbs this year your first goal should be 5 lbs. The timeline to reach the 5 lbs loss should be about 2-3 weeks so that you are losing weight at a healthy pace. Additionally, when you drop those first 5 lbs you will be more likely to shoot for 10 more. After another month or so and 10 more lbs gone March has arrived and you have already lost 15 lbs. The tiny goals you want to reach make reaching the bigger goal seem more possible. Focus on the small goals, accomplish them with the steps needed to take them, and hit the big goal for the year. Check out my post Time Management Tips For The Work At Home Mom. Short term goals are goals that you can reach in 1 to 2 years. These goals are a little bigger than your immediate goals. These types of goals are not meant to be reached immediately and may take some work in order to get there. Short term goals can be broken down into baby steps. If you want to save $20,000 for a new car in two years you would break that down into $417 saved each month. Each month you have a goal of cutting expenses and earning a bit of extra money to get to $417 saved each month. Your long term goals are goals you want to reach in 3-5 years. These goals would be things like saving up money to buy a house, having your business be successful, graduating from college, or any goals that may take awhile to accomplish. Just like with short term goals your long term goals should be broken down into easier to handle smaller goals that you can accomplish slowly to reach the long term goal. One of the biggest killers of goals is the expectation we put upon ourselves to reach a long term goal in a short period of time. If you want to reach your goals you need to stop setting unrealistic expectations with the time period in which you expect to reach those goals. For instance, a goal in which you want to lose a significant amount of weight or save a large amount of money you need a longer period of time in order to do so. Setting an unrealistic goal sets you up for failure. Your expectations need to be realistic. Set the timelines for your goals based on how many steps it will take to complete the goal. The timeline expectations should be the last thing that you set in the goal setting process. Check out my post How To Get More Work Done By Lowering Your Expectations. Pick your goal first without any timeline. What is the long term goal you want to accomplish? Is this a goal you feel passionate about? If you lack passion about your goals you are less likely to reach them. Make sure whatever goal you are going for is something you are genuinely excited about. Now you will break the goal down into smaller goals. Think of it as though you are building a staircase to completing the long term goal. Each step gets you closer to completing the main goal. The first step to a goal should be a small easily attainable step. Then let the goals gradually get more difficult or larger with each step. As you accomplish each step you will remain motivated till you reach the long term goal. Now that you have your main goal and steps figured out start setting timelines to reach some of the smaller goals. Only set timelines for up to 5 steps. You won’t feel as discouraged if you happen to miss a mark on your steps. Just adjust and continue going for the goal you may have missed. If you are like me and need that end goal to have an accomplish by date, make sure you leave it open and subject to change. Additionally, make the accomplish by date actually achievable. Do not set an unrealistic timeline on your goal. This will just leave you feeling defeated. When it comes to completing goals it’s important to take baby steps to reach your goals. If you go too big too quickly and miss the mark it may leave you feeling more like giving up than trying harder. Failure only actually happens when you give up. However, if you continue to work at your goals eventually you will succeed. If it takes a little longer than expected that is ok. It’s ok if you don’t meet your own timeline expectations. What goals do you have? Let me know in the comments below. Follow me on Pinterest for more like this and pin this to your favorite motivation and productivity boards. Thanks a lot. I am so happy to find you. so I am awaiting for your tips for setting my goal. Just give yourself a realistic time table on your goal. Go for one year to complete your PHD, if it takes two it takes two you’re still closer to your PHD than you were when you started. Figure out how many credits you need to finish your PHD and then divide those credits up through each semester. Is it realistic to take that many credits in a semester while still taking care of three kids? Do you need more time to complete your goal? Never feel bad about taking longer to complete a goal in the end you are still completing that goal. I have 3 sons. 12, 6 & 1 yrs old. they occopy my most time besides give time for our Business. how to set my this goal, time frame, Break down steps? I actually am working on a worksheet for this post currently. I should have it on here in a couple of days. 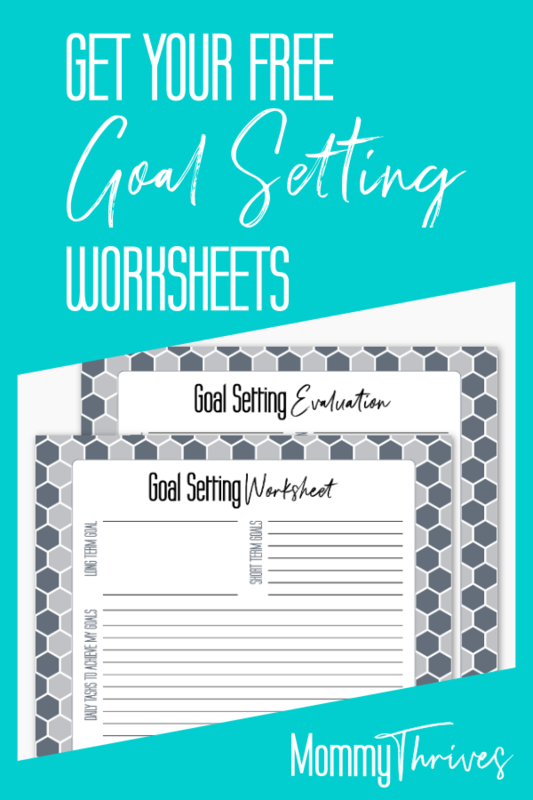 It will walk you through setting up your goals so that you can work through reaching them even with kids and a business that occupies most of your time. Very happy to have found you today – lots of great blogs, thank you! Thank-you, I’m glad you found me. Be sure to follow me on social media or subscribe to stay updated.